13 lactic acid bacteria found in the honey stomach of bees have shown promising results as an antibiotic treatment in a series of studies at Lund University in Sweden (Open access paper: Lactic acid bacterial symbionts in honeybees – an unknown key to honey’s antimicrobial and therapeutic activities). The group of bacteria counteracted antibiotic-resistant MRSA in lab experiments. The bacteria, mixed into honey, has healed horses with persistent wounds. The formula has also previously been shown to protect against bee colony collapse. While the effect on human bacteria has only been tested in a lab environment thus far, the lactic acid bacteria has been applied directly to horses with persistent wounds. The LAB was mixed with honey and applied to ten horses; where the owners had tried several other methods to no avail. All of the horses’ wounds were healed by the mixture. The researchers believe the secret to the strong results lie in the broad spectrum of active substances involved. “Antibiotics are mostly one active substance, effective against only a narrow spectrum of bacteria. When used alive, these 13 lactic acid bacteria produce the right kind of antimicrobial compounds as needed, depending on the threat. It seems to have worked well for millions of years of protecting bees’ health and honey against other harmful microorganisms. However, since store-bought honey doesn’t contain the living lactic acid bacteria, many of its unique properties have been lost in recent times”, explains Tobias Olofsson. This is a very cool: “When used alive, these 13 lactic acid bacteria produce the right kind of antimicrobial compounds as needed, depending on the threat.” As is the note that store bought honey doesn’t contain the living bacteria. My guess is some honey bought directly from farmers or bee-keepers, at farmer’s markets may well still have those live bacteria – but I am just guessing I may be wrong. The findings have implications for developing countries, where fresh honey is easily available, but also for Western countries where antibiotic resistance is seriously increasing. The decision-making power of honeybees is a prime example of what scientists call swarm intelligence. Clouds of locusts, schools of fish, flocks of birds and colonies of termites display it as well. And in the field of swarm intelligence, Seeley is a towering figure. For 40 years he has come up with experiments that have allowed him to decipher the rules honeybees use for their collective decision-making. “No one has reached the level of experimentation and ingenuity of Tom Seeley,” says Edward O. Wilson of Harvard University. Enthusiasm translates into attention. An enthusiastic scout will inspire more bees to go check out her site. And when the second-wave scouts return, they persuade more scouts to investigate the better site. The second principle is flexibility. Once a scout finds a site, she travels back and forth from site to hive. Each time she returns, she dances to win over other scouts. But the number of dance repetitions declines, until she stops dancing altogether. Seeley and his colleagues found that honeybees that visit good sites keep dancing for more trips than honeybees from mediocre ones. This decaying dance allows a swarm to avoid getting stuck in a bad decision. Even when a mediocre site has attracted a lot of scouts, a single scout returning from a better one can cause the hive to change its collective mind. “Bees are to hives as neurons are to brains,” says Jeffrey Schall, a neuroscientist at Vanderbilt University. Neurons use some of the same tricks honeybees use to come to decisions. A single visual neuron is like a single scout. It reports about a tiny patch of what we see, just as a scout dances for a single site. Different neurons may give us conflicting ideas about what we’re actually seeing, but we have to quickly choose between the alternatives. That red blob seen from the corner of your eye may be a stop sign, or it may be a car barreling down the street. I can understand why people get complacent. We have a pretty remarkable run of science and technology finding solutions for whatever peril we face. Also, quite often, future risks are over-blown. Then, people get habituated to reading ominous predictions, followed by a future doesn’t seem to reach those dramatic predictions. But this is a risky pattern to just expect – that no matter what we will figure out some way to avoid the consequences. Risks actually do come true. The obvious result of overfishing, just as predicted, has resulted in collapses of fish populations over and over creating great hardship for those who had fallen victim to that prediction. If people don’t vaccinate themselves (and their kids) we will have ever increasing numbers of deaths and sickness. If we fail to use anti-biotics is a long term sustainable way, our actions will result in many deaths. I am not sure why we find it so easy to ignore the evidence of bad consequences but we do. Partially I would imagine that as problems begin to be manifest countermeasures take affect. So in the fishing example, many people leave that line of work and so the numbers in the industry after a collapse, who are suffering in the present, are reduced. Still I find it odd how easily we ignore the risks in the future. I do understand if there are short term benefits to ignoring the risks (or pretending they don’t exist): so you have fisherman that don’t want to take steps in advance to avoid collapse. Or you have industries and politicians that want to pretend ignoring global warming is a strategy to avoid the consequences. Or you have parents that say, well today we don’t have many risks of sicknesses people get vaccinated against (yes, because people have been vaccinated – if you stop vaccinating your children they we get to experience the avoidable pain and suffering). 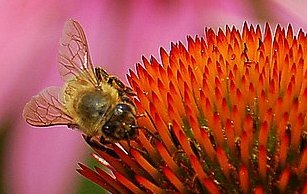 I have been following the honeybee colony collapse disorder for several years (see the end of the posts for links to posts from 2006 – 2010, like this one The Study of Bee Colony Collapses Continues from 2007). It is a great example of the scientific inquiry process. It is messy and confusing and full of studies that have trouble finding what the actually causes are or what solutions will work. There are occasionally mentions of how devestating things could get if the trend continues. In fact stories that seem so devestating that they just don’t seem real. surely either that won’t happen or if it started to some countermeasure would be found to deal with the problem and avoid the most severe consequences. That is basially how I have felt about it. But that is not because of some scientific understanding but just a feeling that hey that couldn’t really happen. Well that isn’t exactly solid evidence that it can’t. farmers use these chemicals to protect their crops from destructive insects, but in so doing, they harm other insects essential to their crops’ production — a catch-22 that Hackenberg said speaks to the fact that “we have become a nation driven by the chemical industry.” In addition to beekeeping, he owns two farms, and even when crop analysts recommend spraying pesticides on his crops to kill an aphid population, for example, he knows that “if I spray, I’m going to kill all the beneficial insects.” But most farmers, lacking Hackenberg’s awareness of bee populations, follow the advice of the crop adviser — who, these days, is likely to be paid by the chemical industry, rather than by a state university or another independent entity. On Tuesday, March 24,  the first known hive of bees at the White House arrived at their location on the South Lawn. You don’t have to count on my crummy photo to see them: just stop by the fence on the Ellipse (south) side: two deeps and a medium of Maryland mixed breed bees, with known Russian and Caucasian genetics. During the 2008 campaign, Michelle Obama emphasized healthy, local food, and since arriving here has tasked her family’s personal chef, Sam Kass, with putting a garden in to supply fresh produce for the Executive Mansion and educational events for the community. Charlie realized that this was a chance to include bees, and to show their important role in putting one of every three bites on your plate. Charlie allocated (free of charge, people!) one of his own hives for the White House Victory Garden, and it will both provide hive products and an teaching opportunities.